In our 5 Best Thick Yoga Mat Reviews you will find extra thick yoga mats with padding from 3/4 inches thick up to 1” thick. Finding these extra thick yoga mats can be difficult. Trust me when I say locating a store that offers a mat over a 1/2“-thick is practically an impossibility. Most yoga mats you’ll find online or at your local store are 1/4″ to 1/2″ thick yoga mats. Which is fine for most users doing stretching and exercise movements you would typically perform on a yoga mat. For some, however, a thicker yoga mat can mean the difference between using your mat the way it was intended, or not using it at all due to discomfort and other limitations. Below you will find five of the best thick yoga mats you can find on Amazon today. In this way, you can save yourself the hassle of driving around wasting your precious time and simply click and order from the comfort of your own home. …We found 5/8”, 3/4” and 1” thick yoga mats that are extremely comfortable and easy on joints, bones, and sensitive areas. 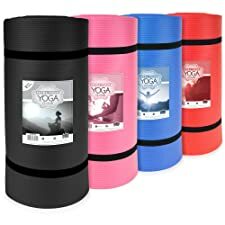 These extra thick mats double as yoga and exercise mats and are non-stick, non-slip mats, include elastic straps for easy transport and convenient storage, and come in many different colors. After many hours of researching and reading customer reviews on yoga mats that have been around long enough to be tried and proven by users for both comfort and quality, I have come up with a list of my five best thick yoga mats that I believe to be the best bang for your buck. What are Extra Thick Yoga Mats? 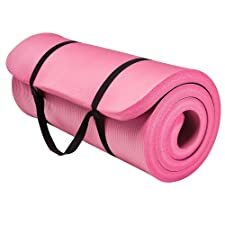 Yoga mats, in general, are used to provide a comfortable non-slip and non-skid workout space for various floor related exercises such as yoga, stretching, sit-ups, physical therapy, and even meditation. The difference between a yoga mat and an exercise mat is the thickness of the mat. Exercise mats are usually about ¼” to ½” thicker than your typical yoga mat. Yoga mats are generally not as thick to allow for certain yoga poses to have a stronger connection to the floor’s surface. There are many reasons to use a thick yoga mat that is over ¼” to 1/2” in thickness. The main reason and most obvious would be for comfort. The second reason would be for its intended use. Let’s take a closer look at the specific reasons why using an extra thick yoga mat might be more beneficial for your needs. So how do you know if you really need an extra thick yoga mat? If you fall into any of the following categories you may want to consider looking into one: larger build or overweight person, seniors, experience joint pain, knee or elbow pain, perform lengthy yoga poses, meditation and deep relaxation routines, Pilates, yoga for pregnancy, physical therapy, or any other exercises and routines where comfort, softness, and additional cushioning are paramount. Now let’s take a closer look at some good reasons why owning an extra thick yoga mat can be beneficial. No doubt, the best yoga mat to own for knee pain is an extra thick yoga mat. There are many yoga stretches and exercises that are performed on the knees or involve kneeling. If you’ve ever taken a Yin Class you’ll know that holding a pose for 5-minutes or longer is the norm. And if you’re on your knees, this can become very uncomfortable. Thus, these extra thick yoga mats are the perfect solution. Meditation typically involves longer durations of time where you are not moving your body, or at least very little movement. A typical ¼” to ½” yoga mat can easily get uncomfortable after a while. So moving around and adjusting your body is the last thing you need to take you out of the zone when meditating. With a 1” thick yoga mat, you can avoid this discomfort and stay in the “zone”. These thick yoga mats are extra soft and make it much easier to lie still for longer periods of time without feeling the need to move around and make adjustments. We all come in different shapes and sizes, so there is no one size fits all even with yoga mats. A yoga mat that is ¼” to ½” thick may be fine for most users weighing under 180lbs, but maybe not so much if you are heavier. The amount of pressure and discomfort on your knees, elbows and other joints can be far greater if you are a larger person. If you fall in this category, replacing and using a 1” thick yoga mat can make all the difference and save you a lot of discomfort. Stretching is by far one of the most important exercises one can do as you get older. It is impractical for most seniors to perform the same types of physical activities they once enjoyed. And working out with weights or performing various cardio exercises is no longer an option. Stretching however can be very beneficial as it is zero impact and helps keep joints and muscles flexible and strong. An extra thick yoga mat would help make stretching much more comfortable and far less painful on the bones, joints, and back. And if not for yourself, these extra thick mats also make a great gift for active seniors such as Mom and Dad. Adults seem to feel much safer when using these mats for headstands or other exercises that involve risky balancing moves. Because they are so thick and safe similar to gym mats, kids also seem to love using them for at home gymnastics practice. Even if you are not the typical yoga enthusiast, you may need to perform specific stretching exercises for rehabilitation after an injury. So why add to the already existing pain by using the bare floor or a thin mat when you could be using a more comfortable extra thick yoga mat? What are the Top 6 Benefits of an Extra Thick Yoga Mat? Let’s take a look at some of the top benefits these thick yoga mats have to offer. You might be surprised to see how versatile these mats can be, and how you can use them for more than just yoga alone. By far, the number one benefit from using an extra thick yoga mat is the comfort it provides when performing exercises and yoga poses of longer duration. These mats provide extra cushion for larger individuals, and they are also great for the elderly or those who suffer from knee or elbow pain. For whatever the reason, these mats create a perfectly cushioned workout platform between you and the floor so that you can concentrate more on your workout and less on trying to get comfortable. Besides comfort in mind, yoga mats were also originally made for the purpose of creating a safe non-slip or non-skid platform to make posing, stretching and exercising safer. These yoga mats can be rolled up and held together with an elastic strap for easy storage, but also come with a handle so you can easily take it along to the gym or yoga studio. These extra thick yoga mats can be purchased for around $30 to $50. So they will not break the bank and are worth the investment when it comes to your comfort. Your more traditional 1/8” to 1/4” mats tend to fold over and crinkle easily. But with the much thicker yoga mats this is a non-issue. These yoga mats can be used for much more than just yoga poses and stretching exercises. Due to the added thickness, they can also be used as exercise mats for you and your kids. They are great for doing sit-ups to support your back, and great for meditation classes. You could even take them along on a camping trip for added comfort under your sleeping bag. I’m sure I could come up with more reasons, but you get the idea. Below you will find a quick feature comparison of all 5 best thick yoga mats. These yoga mats range from 5/8” thick to 1” thick. The following list consists of 5 thick yoga mats we have found and researched extensively. These yoga mats come in many different colors and various thickness levels. Our first three yoga mats all measure 1” thick followed by a 5/8” and a 3/4” thick yoga mat. We figured for some users the 1” may be too thick and so we took the liberty of adding two more options to meet everyone’s needs. There is no one size fits all. For example, a yoga mat that is comfortable for a 150lb person may not be thick enough and comfortable enough for a 240lb person. I have also included my Editor’s Choice and Runner-Up yoga mats to hopefully help with your decision making process. A great alternative to your traditional ¼” to ½” yoga mat is the 1” thick Yoga Cloud Exercise Mat. Probably the most popular brand on Amazon to date, this mat is the perfect fit for yoga, meditation, Pilates, and any other exercises that can be hard on your knees or back. Made with high-density foam, the Yoga Cloud has a no-slip surface, is moisture resistant and easy to clean. Whether at home or on the go, the included carry strap will hold the yoga mat together for storage or to conveniently take along to yoga class. The Incline Fit Ananda is one of my favorite yoga mats. Constructed with extra 1” thick padding it is made for comfort and durability. The Ananda is a great exercise mat for home but is also very practical with its easy carry strap for on the go. The carry strap is not only an easy way to transport your yoga mat but also functions to secure the mat into place when rolled up for easy storage. This strap can be completely removed from the yoga mat so as not to interfere with your yoga routine in any way. This workout mat is very safe and with non-slip material will keep you securely on the mat and keep the mat from moving or slipping on bare floors. If you are concerned about bacteria, germs, or dirt, this yoga mat can be hand washed with a wet towel and soap and hung to dry. For health safety reasons, this product is BPA free, has no Phthalate, heavy metals, or latex. High Quality at a great value. You’ll never want to go back to your regular yoga mat after using this one. TIP: New yoga mats may have a harmless odor fresh out of the bag. To remedy this issue, simply unroll the mat and let it air out for a day or two. If you are looking for extra thick and extra resilient material, then the Easthills Fitness Yoga Mat is the ticket. This mat was built with higher density NBR material making it firmer to ensure a more stable surface for balancing, while still providing enough cushioning for comfort. The Easthills Fitness mat is designed with anti-slip texture for safety and is moisture resistant and easy to wash. 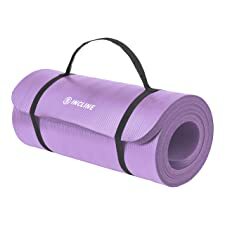 This yoga mat includes a carrying strap so you can conveniently take your mat along to the gym or yoga class. This 1-inch thick yoga mat comes with a 100% money back guarantee. TIP: The foam density in this yoga mat is somewhat higher than the other mats on this list, making it much firmer. However, this also makes it harder to roll up. 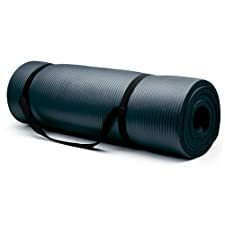 So if you’re looking for a mat to regularly roll together and take along to the gym or yoga studio, this may not be the best thick yoga mat for your purposes. If you’re looking for a mat that is a little more than the ½” but smaller than the 1”, then the CSG ¾” Yoga Mat may be what you’re looking for. This thick yoga mat still provides the cushion and support needed for extra comfort but is somewhat easier to roll and smaller when rolled up to take on the go. If you use your mat mostly outside the home, this may be a better option as it is a little less conspicuous for class. This yoga mat is perfect for floor exercises and yoga classes. The ridged texture creates a cooling effect when in use. This mat also has a non-stick and moisture-resistant surface. The CSG Yoga Mat can be easily rolled up for storage or taken along to the gym or yoga studio with the included carrying handle. The Crown Sporting Goods Yoga Mat is another thick density product that measures 5/8” thick. This might be an option for those of you who require a thick yoga mat that is less conspicuous than the 1” when going to yoga class. This non-stick ridged textured high-density foam mat is moisture resistant and measures 71 x 24.5 inches. This thick yoga mat comes with a convenient carry handle for easy transportation to your next yoga session and is designed with safety in mind with its no-slip bottom. I would only recommend this mat if you’re looking for something slightly thicker than your typical ½” thick mat, and you are less concerned about extra joint or bone comfort. Reviews tend to be mixed on this product. Perhaps due to the lower density and squishiness of the foam itself. I decided to pick two winners for this review as I find both to be great choices but for different reasons. Both yoga mats are extra thick but one is a 3/4″ thick yoga mat and the other a 1” thick mat. Both are very similar in features, yet offer the option of choosing a different thickness for user specific needs. For example, someone who is a smaller build may still want the extra cushion and comfort but may think the 1” is overkill for their purposes. Thus the 3/4” would be the perfect fit for them. On the other hand, a bigger person may desire the 1” since it will provide them with better support and comfort. There are many reasons I could come up with, but in the end, it all boils down to your specific needs. So let’s take a look at our winners. For the Editor’s Choice, I was somewhat torn between the Ananda 1” thick yoga mat by Incline Fit and the Yoga Cloud 1” yoga mat. Both have very similar qualities but in the end, I had to make a decision and thus chose the Yoga Cloud. The Yoga Cloud is very popular on Amazon and coincidentally was also their “Amazon’s Choice” at the time of this review. This mat has all the qualities we are looking for in a thick yoga mat including the high-density foam with no-slip surface and easy to clean moisture resistant material. The added elastic strap is great for keeping the mat rolled together for easy storage and also includes the detachable carry handle for safer workouts and convenient portability. And for those of you who like a broad selection of colors, they offer black, blue, Red, and Pink. A color for everyone. If you need more convincing, just go through the over 450 reviews on Amazon to see for yourself why this 1” thick yoga mat received its 4.5/5 rating. My second choice for the Runner-Up award would have to be the CSG 3/4” thick yoga mat. This mat also delivers most of the great qualities of the Yoga Cloud but provides users who may feel that the 1” might be too thick a great alternative. Even at 1/4″ less than our 1″ thick mats, the CSG provides exceptional comfort and support for the right reasons. If you would rather have a mat that is little less bulky and less conspicuous then this mat is definitely a good choice. The following is a list of popular questions asked about yoga mats. This Q&A is provided to help answer some questions or concerns you may have regarding these yoga mats. Which side of the yoga mat goes on the floor? Yoga mats are typically made with each side serving a unique function. The one side that is smooth and somewhat shiny is usually considered the sticky side of the yoga mat and is therefore used on the floor side to prevent the yoga mat from sliding or slipping. The other side of the yoga mat is typically designed with a ridged surface so the user can safely exercise without falling or slipping. Do yoga mats wear out easily? Just like with most things after prolonged use, wear and tear are inevitable. However, if you take proper care of your yoga mat you can extend its life and enjoy the same mat for many years. It is a good idea to look for moisture or waterproof mats. Keeping yoga mats dry and clean will prolong the life of your yoga mat and keep it from deteriorating as quickly. Furthermore, it is also a good idea not to wear shoes or any accessories that could scratch, tear, or puncture the mat. Take these precautions and use common sense when using your yoga mat and you will enjoy many hours of usage for years to come. One of the best ways to clean your yoga mat is by using yoga mat wipes or damp cloth or sponge with very little soap. In most cases, just a warm damp cloth will do the trick. If you are looking for something more natural, you could fill a bottle with water and mix in some vinegar or your favorite essential oil. Just spray your mat lightly and go over it with a warm damp cloth. It is important that you always make sure your yoga mat is wiped dry and is always located in a dry place, even when stored away. 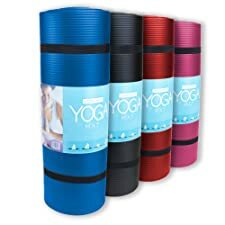 I hope this article on “The 5 Best Thick Yoga Mat Reviews” has helped answer some questions you may have had and also helped you find what you were looking for. We understand how difficult it can be to find anything even close to a 1” thick yoga mat. So hopefully we have saved you some time looking for and researching these mats. We sincerely hope you have found what you were looking for and wish you all the best and great success with your new 1” thick yoga mat. Best Vibrating Foam Rollers for deep tissue massage to loosen up knots and treat soreness.